How do you prioritize in accomplishing both your short-term and long-term goals? And how many of them could you be chasing on your radar, right now? 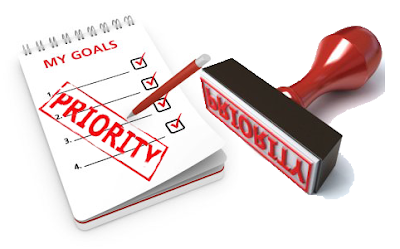 Probably many, in fact too many, prioritizing of goals often is quite tedious and overwhelming because of the semblance order of schedules one has to put up with all the time. Well, the ultimate solution for you to achieve your goals is quite simple: cut down your list of goals, starting with those which are most manageable and important to you first and work through to the very least. Here, simple ways a goal-setting junkie can easily follow to accomplish their goals. Start by jotting down all the major goals you’ve currently got trending on your radar or any you’re hoping to start. You might consider dividing this list into “personal” and “professional” categories for the purpose of ease of convenience. Of course, this should be something sizeable and something that stretches far beyond your regular daily routine (“go to work” and “pay bills” really don’t count), rather here is a series of common goals to help you figure out yours such as lose weight, quit smoking, acquire a new skill and so on. Take enough time to think through this list properly, or otherwise they may begin to mount on each other and take you years to accomplish instead of months. Do you feel a sickening itch every time your look at your list? If so, you’ve definitely got too many goals on your radar. Try to cut them down and focus on each item at a time. There are several methods you can choose to achieve this. For instance, start by listing your most important goals first, this will give you an upper-hand of allowing you to tackle something really worthwhile, even life-changing and also provide you a much clever way of following through stuff. You can also try prioritizing your smallest goals first, sometimes a small win at the very start motivates a person to try something much bigger and greater next time. Or maybe try prioritizing big impact goals first, the ones you really think will make an immediate and a huge dramatic trajectory in your life – like a career change or getting a new qualification. It’s up to you to consider the method you choose to prioritize your goals. Lastly, from the very list of important goals you’ve jotted down, consider which one from the list is your top goal – the one you’d dare risk everything with all means to earn it! Once you’ve figured out your top goal, make sure you set a deadline for this goal. If it’s a long-term goal, and needs some considerable length of time, set milestones and dates you’re certain you’re going to accomplish this goal in the end. For example, schedule a window to apply for a specific course within a particular date.